Because of St Gemma's great desire during her lifetime to become a Passionist, although for various reasons she was never accepted into their Congregation, after her death the Passionist soon considered her to be one of their number, and therefore she is considered a lay-Passionist. And while her feast day is normally celebrated on the day she flew to heaven (April 11th), the Passionist Congregation celebrate her feast day annually on May 16th. In honor of the Passionist feast of St Gemma here are links to the 9-day Novena of St Gemma which begins this year (2013) on Wednesday May 8, and also the 3-day Triduum which begins on Tuesday, May 14. 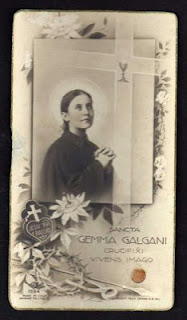 Also for those interested I have posted the "Divine Office of Readings for the Memorial of Gemma Galgani- May 16"
This is the most awesome post ever.Thanks for all what you do for us.